A better workflow helps marketing and creative teams keep up with rising content demand. Marketers and creatives are tasked with producing a higher and higher volume, variety, and velocity of content—and bandwidth pressure on both sides can take a toll on their traditionally solid partnership. That’s why uniting marketing and creative with workflow is so critical: It facilitates the collaboration and efficiency both sides need to stay ahead of rising demand by delivering best-in-class content and campaigns to market. Continuous, sustainable success requires true harmony between marketing and creative—and workflow makes achieving it easy. 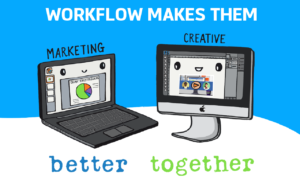 See how workflow makes marketing and creative better together.